In March 2003, thousands of protestors swelled into Tahrir Square, enraged over America’s incursion into Iraq. I was looking out the window of my office at the American University in Cairo–alarmed to see riot police, clad in black, running in formation down a main street. Suddenly, Falak Farah, the chair of our department, who had survived the Lebanese civil war, stood in the doorway: “You better get a ride home. It might turn into a mob.” I remember how frightened I was. The crowd was beating up foreigners who ventured into the melee. More recently, in Chemnitz, Germany six thousand demonstrators took to the streets, arms raised in Nazi salutes, furious over Angela Merkel’s immigration policy. The following day, a huge counter-protest responded with: “Heart Not Hate.” On the nightly news, there are also the recurring images of refugees from Africa and the Middle East, wrapped in foil blankets at ports. More tragic, still, are tiny, drowned children washed up on beaches. 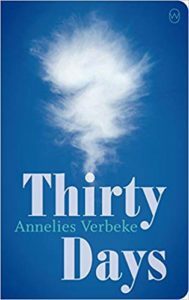 While the novel Thirty Days, by Annelies Verbeke deals with these very contemporary, divisive themes of immigration, displacement, racism, and the rise of hate groups, it is not an overtly political novel, but an artful examination of the rich, interior life of one Senegalese immigrant, living in Belgium. Before being translated into English, Thirty Days resonated with a Dutch audience; in fact, it was chosen as the best Dutch novel of 2015 by readers of a prominent Dutch newspaper. Alphonse, the main character is not a migrant, but a naturalized Belgian citizen, who speaks four languages–a musician who earns his bread and butter through painting houses. Deeply intuitive, Alphonse is sympathetic to others and becomes a father-confessor to many of his emotionally disturbed customers. Because he paints people’s houses, he has a window into their lives: “Houses often inform Alphonse of the kinds of stories they’re going to tell.” In the opening chapter, there is a hint of upcoming darkness, when his customers, Els and Dieter tell him that their cat was murdered by their neighbors, Sieglinde and Ronny. Later, we learn that Sieglinde is pregnant from Dieter, the neighbor who is supposed to be the enemy. Alphonse, a modern-day Good Samaritan, becomes involved in a number of rescue missions of unlikely characters, whom he meets on the road. For example, when he goes to a shawarma shop to buy a sandwich, the Afghani owner, Duran, accidentally cuts his own finger off. In the course of taking Duran to the emergency room, he learns that Duran is an artist of sorts, who makes delicate ice sculptures. Elsewhere, he meets Madaleine Claeys, one of his customers, who is haunted by hallucinations of her dead, disabled younger brother, but who finds comfort in Alphonse’s peaceful presence. At least two of his acquaintances try to commit suicide. Sieglinde’s teenage daughter, Lana, calls him when she thinks her distraught mother has tried to kill herself. Gewijide, a neighbor of one of his customers, abused by a priest as a youngster, hears voices. Another lonely figure, Willem, an elderly French teacher, often shows up at his doorstep. His girlfriend, Cat, the daughter of Belgian diplomats, now a professional translator, doesn’t enjoy sharing her popular partner with so many others and comments that he is “a magnet to the deranged.” Alphonse’s mother worked as a nanny for Cat’s parents, which is how they met. Alphonse was brought up by his uncle and barely knew his father. Cat’s parents, Jean Marc and Constance De Stassart, are unhappily married but stay together because of their expensive villa. When his friend, Amadou, arrives for a visit, we learn that Alphonse was devoted to his music and a bit of a womanizer in Senegal. In the present, he rarely plays music, and now, has found love and companionship with Cat, who is recovering from ovarian cancer. However, Amadou’s visit brings back the unpleasant memory of the betrayal by his friend, Fabrice, another musician, who stole Alphonse’s songs for an album, which made it big. Amadou and his girlfriend, urge him to play the kora, (a twenty-one string lute played in West Africa) and he remembers how much joy music brought him. His happiness is diminished when Cat returns in a “stinking mood” from the bicycle shop. The couples had planned to rent bicycles for a short expedition to a nearby windmill. Amdou suggests that the hostility of the owners of the bicycle shop was based on their racism. But there are echoes of a racist legacy from the past as well. Willem, who is a history buff, asks Cat and Alphonse to go with him to visit a cemetery near the French border, host to the graves of African soldiers, sacrificed by the French empire in 1914. Nearby, a man “appears right in front of them like a ghost,” who has been badly beaten by the police. Alphonse calls one of his customers, a doctor, to treat the man’s wounds. Alphonse, Cat and Willem are shocked by what they see in the middle of a field: “tents of ragged tarpaulin and dirty blankets, men around a fire.” The migrants intend to cross at Calais and cannot be dissuaded from the risk. In the course of the next few weeks, Alphonse takes food to them, feeling he must help. When Alphonse returns, alone one afternoon, to the make-shift camp, to bring the refugees more supplies, he finds it deserted. There is no sign of people, just “a pit scattered with charred scraps of tarpaulin, blanket, plastic. Several burnt shoes, the trampled remains of a sweater.” He is frightened when a skylark falls out of the sky–the bird’s “broken legs and wings, the snapped neck, the splashes of blood.” At first, he surmises that the Syrians and Afghans have quarreled, but then, understands when he sees four or five men walking toward him with “cudgels, bent bars, sharpened rods.” The scene is a chilling reminder that mobs don’t necessarily consist of thousands of people, nor do they brew only in cities. Alphonse tries to speak to the men in Dutch, in French, in English and even in Spanish. But they advance upon him, as if they are cave men, intent on destroying a monstrous beast. In this moment, language doesn’t matter, since their rage has made them blind and deaf. The story, narrated in third person, allows us to be inside Alphonse’s gentle soul as the frenzied blows fall upon him. He remembers “the scent of Cat” or “the kora vibrating his lap” or an older memory, “the furrows of his mother’s armpit” when he was a baby, being nursed. Verbeke’s description of violence, feels as if it is happening to us–and we are shocked by the horror. Gretchen McCullough is a writer and translator, teaching at the American University in Cairo. Her stories and essays have appeared in:The Texas Review, The Alaska Quarterly Review, The Barcelona Review, NPR, Storysouth and Guernica. Translations in English and Arabic with Mohamed Metwalli include: Nizwa, Banipal, Brooklyn Rail inTranslation and Al-Mustaqbel. Her bi-lingual book of short stories in English and Arabic, Three Stories from Cairo (2011) and a collection of short stories, Shahrazad’s Tooth, (2013) were published by Afaq Publishers in Cairo. You can read more of her work by visiting her website.